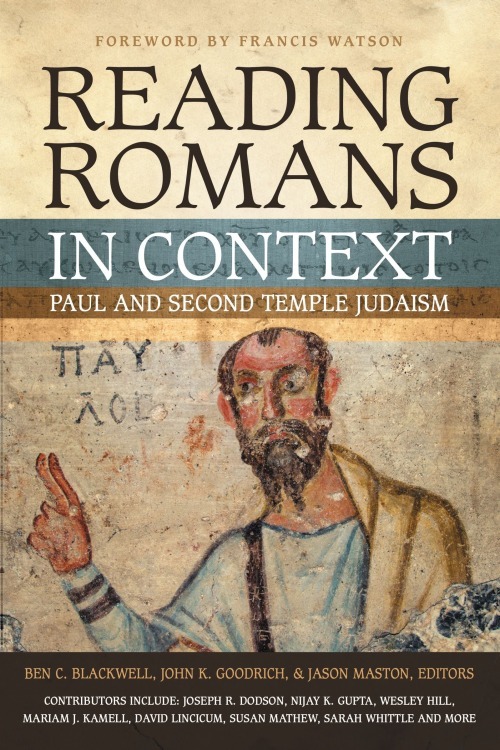 I have contributed a chapter to an exciting forthcoming textbook called Reading Romans in Context: Paul and Second Temple Judaism (Zondervan, June 2015). In my opinion, one of the greatest needs for Bible students is to properly understand the New Testament in its socio-historical context. This textbook aims at bringing portions of Romans into dialogue with a variety of illuminating early Jewish texts, authors, and inscriptions. It is meant to be very accessible to the uninitiated. Part of the fun is that the editors and authors are mostly a part of a group of students that studied in England and Scotland around the same time and were trained to become historians as well as theologians. My chapter is on 1 Maccabees and Romans 14-15. One of the best parts of this book – it’s short (only 160 pages), so it won’t “clog up” textbook options. Also happy to see female scholars included in this work, my friends Sarah Whittle, Mariam Kamell, and Susan Mathew! Truth be told, the only essay I have read the from book is my own (zzzzz), so I am excited to read the work of my colleagues and friends. If you teach Romans, or are looking for a good short supplementary textbook for an intro course, please keep a watch for this summer release.